FIGURE 2.1 (a) Juvenile stage of a twining liana. The plant is self-supporting and the stem below the circumnutating apex is relatively stiff and has a high Estr (French Guiana). This stage of development often has mechanical properties that are similar to those of the stiff terminal "searcher" twigs of adult climbing plants [see (b)]. (b) Apical, young stage of development of a mature twining liana (Condylocarpon guianense) (French Guiana). Such axes are relatively stiff and span long distances to reach host supports. (c) Old stages of growth of a woody twining liana. The stems are firmly attached to the branches of the canopy, and the older basal portions are swinging freely from the canopy (French Guiana). Such stages have often very low values of Estr (d) Old stage of growth of a twining liana stem traversing from one tree to another and forming a very firm attachment between the two (French Guiana). The stem was observed to be under significant tensile stress when the wind blew and the trees swayed violently in the wind. (e) Old stage of growth of Bauhinia guianensis (monkey ladder) (French Guiana). The mechanical properties of the old ribbonlike stem are characterized by low values of Estr because this species attaches to the host tree by numerous tendrilar organs. The branch to the left is a reiterative branch with "young" development and circular cross section. These reiterative branches are very stiff. attachment fails, a relatively stiff stem would prevent the stem from buckling and falling to the ground like a coil of rope; the relatively stiff stem would allow the plant to sway and perhaps secure attachment to another host. In this case, a good strategy would be to retain relatively stiff mechanical properties. Because climbing stems employing hooks and spines are more loosely attached to the host plant, swaying or movement of the host would also probably detach the climber from the support rather than being deformed and possibly becoming damaged during movement, especially if the host supports were massive. Climbers that are firmly attached, such as stem twiners possibly have rather different constraints between attachment type and stem mechanics. Although mature to aged twining stems can sometimes be observed to have loosened and fallen in coils from host trunks, many firmly secured twining connections that are reinforced by wood production will probably never disconnect from the stem unless by failure under extreme loading. In such cases, it is of no advantage to the climbing plant to invest in mechanically stiffening the older basal stem. In fact, with such types of connections, the host or climber will actually fail, possibly under the weight of the growing liana, before the twining attachment does. Failure of the host tree would probably result in catastrophic movement and stresses to the climbing plant stem; under such circumstances, a relatively slender stem is less likely to fail if it is flexible rather than relatively stiff. Furthermore, movement or swaying of host trees could exert extreme stresses and strains on the connected climbing stem, which if firmly twined or knotted to the host, would require high compliance to avoid failure . Extreme movement of host trees might not occur often, but infrequent storm conditions with strong winds and large host movements could excessively load the stems of firmly attached climbers. 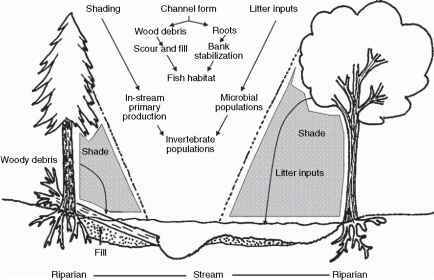 Furthermore, tree falls and the formation of forest gaps are important elements of forest dynamics, particularly in the tropics. Plants that are firmly attached to trees and branches that fail are more likely to survive if compliant. Alternatively, more weakly attached climbers might avoid mechanical stresses by becoming unattached from the host. 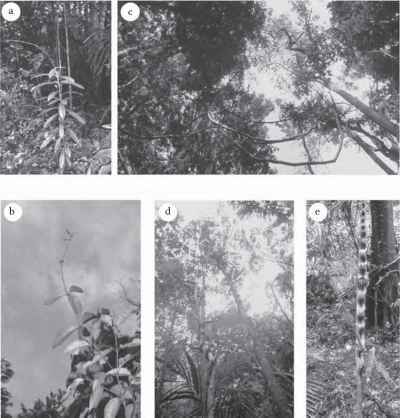 In the following account, we investigate the bending elastic mechanical properties of 43 species of tropical and temperate climbing plants; we explore how mechanical properties of the stem vary with the type of attachment, overall height, size, and diameter of climbers ranging from woody lianas, which can extend to the canopy of the tropical rain forest, to more diminutive climbers or vines barely reaching a meter in height. The study has particular significance for understanding the likely ecological constraints on different climbing habits of different species. We have listed the species tested along with their type of attachment, taxonomic affinity, and approximate size and position of the mature climbing plant in the surrounding vegetation. We have differentiated between five types of attachment modes: stem twiners, tendril climbers, hook climbers, branch-angle climbers, and leaning climbers. The categories of climber are somewhat generalized because, for example, both tendril and hook climbers include plants with varying types of hooks and tendrils. An important omission in this study is root climbers, plants that climb on the host plant via roots produced along the stem. While these are an important element in many ecosystems, they are usually attached firmly along much of their entire length apart from the apex and as such differ from the majority of vines and lianas. In this study, we compare plants that attach themselves to the host plant but do not "grow" directly on the host plant as do most root climbers.